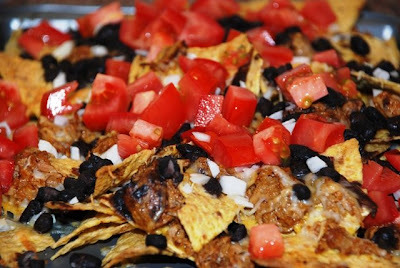 I love the simplicity of nachos, but don't eat them very often because they are so not good for you. I think what I really love are the condiments. I always serve my nachos with an extra large helping of salsa, guacamole, and sour cream. 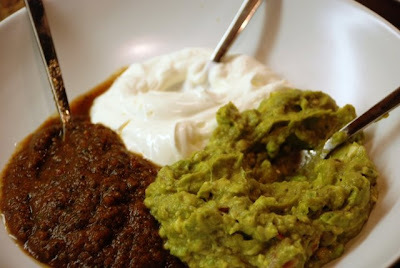 I made a really good roasted tomato and poblano chili salsa and used that as part of the base for my guacamole. I also used left-over’s from my Cochinita Pibil (pulled pork) from the night before, so it came together quite nicely. The only thing I was missing was a big slushy margarita! I would love to share my salsa recipe, but it is a secret family recipe from my friend Silvia, that I was blessed with and I promised not to give it out! All I did was layer pork, onion, tomato, black beans, and cheese in layers with chips and bake at 400 degrees until the cheese was melted. The salsa looks great -- and perhaps your friend would reconsider. After all, recipes only live by being shared.